Home » Listings » Wall-to-Wall WOW in Brookville! Wall-to-wall WOW! 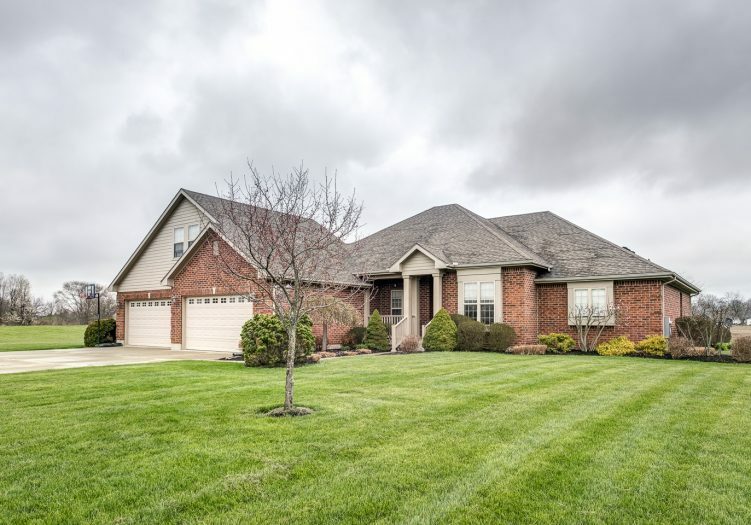 This custom, BRICK RANCH is surprisingly large and packed with QUALITY FINISHES! Step inside to the TILED ENTRY flanked by a STUDY on the right and a dining room with DOUBLE-TRAY ceiling on the left. A gas fireplace with STACKED STONE is the focal point of the great room which boasts HARDWOOD FLOORS and opens to a SUNROOM! The chef will love the kitchen with WALNUT cabinets, granite, and STAINLESS appliances! The master suite features a bath with dual vanities, MARBLE flooring, and jetted tub! Two other bedrooms and a full bath are located on the other side of the split floor plan. Guests won’t want to leave with two bedrooms, a full bath, and a SITTING AREA above the garage. The basement with 9’ ceilings offers 1400 sq ft of living space, including a REC ROOM, craft room, and GAME AREA! Outside, enjoy the 1.9-acre lot, PAVER patio, 4-car garage, and brick shed with garage door and COVERED PATIO! Updates: HVAC (2015), tankless water heater (2015), and softener (2011).